Our garden has bumper crops spread over the full year. After distributing them to neighbours, friends and family we make juices particularly from mangoes, cherries and bellfruit. We sell our jackfruits and mangoes after keeping enough for use and distribution. What fruits grow in your garden? . Wow! You truly grow a huge amount of different fruit. That is so nice to see... I can only imagine how much money it saves you in the long run since you don't have to buy fruit at the grocery shop. Plus you know exactly where it came from. As I said in the other post discussing garden, my aunt is the one that also grows fruit trees. The ones that I know she has are: apricot, cherries, kiwis, apples, pears, peaches. I still remember when I was a child I loved going to her house because she let me climb the cherry tree to help her harvest it! She does similar things as you when it comes to fruit. She always shares it with us, her family and her friends. If she still has some left she loves to make jams and fruit juice. You should try her jams... They are beyond good. I always look forward to it. Also, how profitable is selling your mangoes? I do not have those fruits which your Aunt has. I love peaches and apricots which I buy specially dry apricots. There is hardly any money in the mangoes that we sell. I do that just because they are surplus. Why don't you post a recipe of that jam that your aunt makes? Currently the fruits in my garden have been going through a bit of a rough patch. It was an extremely cold Winter, with unexpected frosts during the Spring so many of my fruit trees actually didn't flower. That being said, there have been better years and during those years we did plenty of things with our fruits. From our cherry tree, we would gather the cherries and bake cherry pies, turn them into wine, or preserve them as a sweet side dish with meals. We would preserve apricots as well, but also turn the excess apricots into an extremely potent distilled drink. Apples and pears are mostly eaten fresh and the excess is turned into juice or preserves. Plums are typically distilled into plum brandy. You could say for the most part we either preserve our fruits, or turn them into wine and distilled spirits. You really made my mouth water with all those fruits that do not grow in my garden specially those cherries. Your cherries must have been the sweet variety. What I have is tart cherries that cannot be eaten but I get lovely juice out of it. I did try to make jam but it did not turn out that good. Never heard of distilled drink from apricot. i love dry apricots. My home's garden has three types of fruit tree namely lime tree, mango tree, and jack fruit tree. We usually consume the fruits ourselves. The reason is there's not enough fruit to sell and we rather eat the fruit of our efforts. My grandmother loves to use the lime juice to cook curries for us. Fried jack fruit is very delicious so we tend to use most of the jack fruits to make this food. There are many ways to preserve the jack fruit. Ofcourse there is plenty of work. I only preserve fresh jack fruit segments after cleaning them. I make small packets and deep freeze them. They last us almost a year. Here they make what we call papads but involves and lot of work. And then deep fried chips also remain for a long time. That is interesting indeed. My family does not like preserved jack fruit though. That is one of the reasons they decide to deep fry these fruits instead. We've been in our home only since November and though we knew we had a few fruit trees, we really didn't know what we had growing in our front and back yards. As it turns out, we have quite a bit of things growing, both in fruit trees and flowers. Spring and summer have been quite fun watching things grow and discovering what bounties we have. So far, we seem to have a green apple tree, some cherry trees, and two peach trees. The peach trees don't have much on them, literally two peaches! I've since discovered that there was some spring pruning we should have done, so hopefully next year we'll get it done and enjoy more peaches. Our cherry trees didn't produce much of anything, but I haven't yet pinpointed why that might be. Our little apple tree is the only thing that seems to be putting forth a small abundance, so we look forward to hopefully enjoying those. We are planning on trying to make some homemade cider and applesauce... yum! Your garden must be happy that you have come to watch it grow. For me it is a daily affair. Even a new shoot on plants countless of them will not miss me. And what with yielding fruit tree. I am happy that you do after all have some fruits and apples are such a treasure. Apples do not grow here. I am still struggling to have fruits in our garden. We have almost always lived out in the country and had plant of room and sunshine to have a garden. For health reasons, we had to move into town, and the house where we live now has trees all around this property, and also around the adjoining properties. Since most of them are deciduous trees, they lost their leaves in the fall, and then we get some sunshine; but by then it is pretty much too late for most gardening because winter is on the way. In the spring, before all of the trees leaf back out, we have glorious weather and sunshine, and all of the rose bushes and berry bushes and plants will start to grow again. However, gardening just doesn't work, and my tomato vines just get tall and straggly with no decent tomato fruit on them. I am thinking that I would do better just to try and cultivate perennial crops like berries, and those do not need to be planted each year and can get a good start before being hidden in the trees all summer long. You will have to first study and find out what is lacking. It could be the morning sun or it could be a problem with you soil. One things is there and that is your enthusiasm. With that anything can be achieved. Good Luck with your dreams. Those are good fruits! And yummy too! I don't have my own garden but I remember my grandma having one. We would always clean it regularly for dead leaves and plants, etc. What she would do is harvest all those ripes one for our personal food, and nothing more. I don't know if she has sold some to her neighbours before because every that we would go to her place, we would always pick those ripe fruits and eat them. My neighbours expect us to give them free and that is what we do. Or perhaps they feel odd to ask us if we would sell them. And we feel odd to ask them if they would buy from us. But I have seen some households have fixed customers year in and year out. Right now I live in a very small apartment, so my garden is like zero. But my parents do have a nice patio/backyard, where my Dad likes to spend some hours daily. So far he has grown cherry tomatoes, papaya, avocado, and lemons. You don't get to pick up those all year around, and at same time, so he is always picking up one thing or another. Cherry tomatoes are for home, we cook home made pizza, sauce, salads. Papayas are used to cook papaya sweets, delicious recipe. Lemons and avocados are shared with family and neighbors, they already know my Dad likes to give some, they say they taste really good, and my Dad feels really happy to share and know they are enjoying his work. That seems a great ambiance what your dad is creating for you and the rest of the family. One hardly realises what role gardening plays in people's lives without much ado. I can relate to that as the joy I get when there is life in my garden that feeling cannot be explained. My mom loves to plant fruits in our garden, we have Jackfruit, Soursop, and Indian Mango. We usually eat the fruits we get from our garden and sometimes we make shakes and ice candy out of the fruits we harvest from our garden. Ice candy is best made from fresh fruit juice. We too get loads of jackfruit. This year we got to sell them after keeping some for us. We also preserve the fruit for future use. You have a huge garden, are you staying in a bungalow house? There isn't such a big land for a double storey house in our country. The most I had was a coconut tree and a papaya tree in the backyard. Front garden are mainly the carpet grass and shrubs. We did enjoyed the coconut water during hot weather and bundles of papayas when they are ripe but the crows became a nuisance pests. My total area is 20,000 sq ft where most is gardening and the house we live in. The only open space are the footpaths. We gave up city life just so that I could get space for gardening. City land is far too expensive. Sad that your area is not protected. Gardens need to be protected not only from animals even from human beings as they will rob everything. We have invested on a solid compound wall. can buy in your local garden center. Blueberries are low maintenance, fruiting after about 3 years - and in the meantime make a very attractive patio plant. If space is tight try the compact variety Blueberry ‘Top Hat’. Water blueberries with rainwater as the lime in tap water will reduce the soil acidity over time. Blueberries are new to this area although I have seen pictures. That is a nice account of your gardening experience and am happy you will work on it once again. We have a vast area and quite a few of seasonal and perennials are regularly grown along with crotons. I was raised in a family that always had a garden and did a lot of canning and preserving. We had a fig tree outside, and I remember my grandmother making awesome fig preserves for our breakfast biscuits. That was delicious. She also made apple sauce and pear jam. We would eat a lot of the fresh fruit, but my grandparents' philosophy was never to waste anything, and so they would try to preserve and also freeze whatever they could every year. They both grew up in the Great Depression, so wasting food was never an option. You seem to have had big time with fruits. Our fig tree is dying after yielding for well over 26 years. What is your situation now? Do you have anything growing now? Even pot culture can be quie successful. Although I have enough space I still have pots for certain flowers that include roses. I live in an apartment so I don't really have a garden, technically, but I do grow some herbs indoor which is enough for me for now. I use it for my cooking because I do love to cook and I like that I can use fresh herbs instead of store bought ones which I don't know if was tainted with pesticides. I do hope to be able to move to an actual house someday where I can have an outdoor garden and there I will plant vegetables I could use for my dishes. I have a few herbs in my garden. We put them all together and make a chutney or paste. We do add some other ingredients such as onions, green chilli, salt, coconut and sugar to make it palatable. Hope your dream of having some place to do real gardeingn will come true. I think many ways to do if there are fruits growing in our garden. First, I'll get some of the fruits and I will make fruit juices for my family. Second, I will sell the other fruits in the market to have an extra income that will help me to grow more fruits. Third, I will grow more fruits as it is good not only in our body but also in our environment. Here where I live it is difficult to market any produce unless one gives it to stores that offer very little. We do that sometimes as it is better that way than just filling our compost pits. My mom has mountain apples and honeydew sugarcane and cherries and pomegranates and mangoes in her garden along with some passion fruit and star fruit. They are all great fresh and we make passion fruit juice and star fruit juice. We would sell the mountain apples as the tree is usually loaded around harvest time. 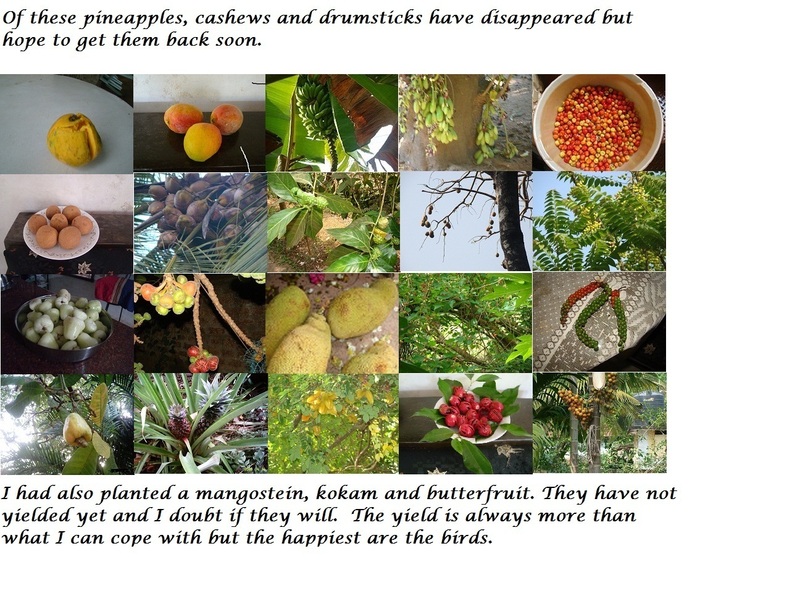 We are considering other fruits like dragon fruits and we once had some paw paw tress that grew quite long and flourishing. Mom also has some banana and fingerose tree(a type of banana but the fruit grows half the size and has a distinct taste from banana). We would sell and sometimes give to the church for harvest. It's a great money saver and access to fresh delicious fruits is definitely another plus above the rest. That's really great! We also have a garden, which was far away from my home. We used to grow vegetables, greens and also planted few mango trees last year. My mom used to cook those vegetables and greens, sometimes when in excess we gave those to our neighbours. We also have a moringa tree behind my home. In season times, we would get more than 50 drumsticks in a day. My brother and me used to pluck those in the morning times, and we happily sell them. And yay! it's in season. Vegetable growing in the garden is something I'd be interested to know too. I have not done much work on that point. But simply some day I wish to own the house and do the hardwork for the same. I think some of the flowers and few fruit plants is what I can currently try in our garden. But hopefully that changes soon. Basically when I saw a fruit bearing plant that grows miraculously in our garden. I will transfer it immediately in a right place and start taking care of it until it grow as high as my knee. Sad to say that their is no chance of a fruit plant will pop on our garden unless I buy seedlings and grow them. Having fruit trees in your background must be great because you can consume it by yourself or sell them. basically if i see a fruits in a garden i usually check it if its already ripe because theres a time that the fruits you will get maybe its riped. We do that with our mangoes. Even when the mangoes look green they are ready for harvesting. If we do not do that birds and squirrels will be busy dropping them down half eaten. In fact we wait for the first fruit to be dropped down by them and then we know it is time to harvest. WOW! that's great having lots of fruits to sell can earn some cash. we also have a small garden we only have 1 fruit available and that's banana we don't sell those fruits because they are only few instead we eat them in the times of harvest. i like planting fruits if only we have bigger garden i would love to do the same as you do selling lots of fruits its really nice. Here unless you have bulk supply one cannot expect much profit. There are no direct sales and shop keepers want huge quantities. We too have banana plants but they take long to yield and only one bunch per tree. At this point in time there is one plant that is yielding. It will take atleast another six months for it to be ready. I do grow trees in my garden and they grow apples and oranges as well. Also, i have a lot of grapes seefs that I'm interested of planting in the future as well. I do have a plum tree too! Where did you get the seeds from? Here I have seen grapevines which they propagate by cuttings Grapes need a cooler climate. I tried growing but this weather does not suit them. I remember plucking plums from a tree that my nephew in the US had in his garden. Nothing like plucking fruits straight from a tree. I love fruit juice a lot,so I use my fruits as fruit juice,chill them and take them especially in a hot weather.But I don't want it in liquid form,I take them just like that.I just wash them,peel them and eat them that way. I know what you mean. You prefer the juice straight from fruit rather than extracting it using a fruit juicer. I too like it that way but when there is a bumper crop we have to preserve the fruit in the form of juice for future use. We normally have mango and chery juice stored that way, as also bell fruit juice. I have a big garden so I have a lot of fruits growing in it. I have passion fruits, bananas, lemons, oranges, soursops, tamarinds, papayas. We don't sell the fruits because we prefer to give them away to our family or some of our neighbors. We have mangoes and guavas trees too. That is a huge collection. When I was a kid I used to pick up ripe tamarind that used to fall from our neighbour's tree. We never liked the fully ripe but the one that was partially ripe had great taste. Now I just cannot think of eating it as i will find it to be sour. I do not like sour things now. My grandmother has papaya's trees and when grows a lot of them she gives them to friends and family. The good thing is that she always eat papaya and drink it too. The papaya has a lot of benefits for our health and helps us to have a beautiful skin. We too have papayas but they rot in the rains and we have to plant them all over again. The seeds give out many seedlings. We pick the best ones and plant them again. We get papayas every year. We only have guava and mango in our garden, but we harvests a lot of fruits from these two trees. Since we're a big family, our harvests are just enough for our consumption. One time, there's an instance that we sell our mangoes, but it happens only once because we really starved in mangoes. So until now, we stop selling our harvest and just reserve it for family consumption. I really love the fruits from our garden because I know that it's safe because we didn't use any chemicals to grow it. We had 3 guava trees. They are all dead now. One was really giving us good yield but the flowering creeper - Garlic vine climbed all over it and killed it. The other two just died without reason. Now no matter how much we try they just do not live. We have two small plants now and i am hoping they will give out fruit some day..
We have an indian mango tree on our garden. 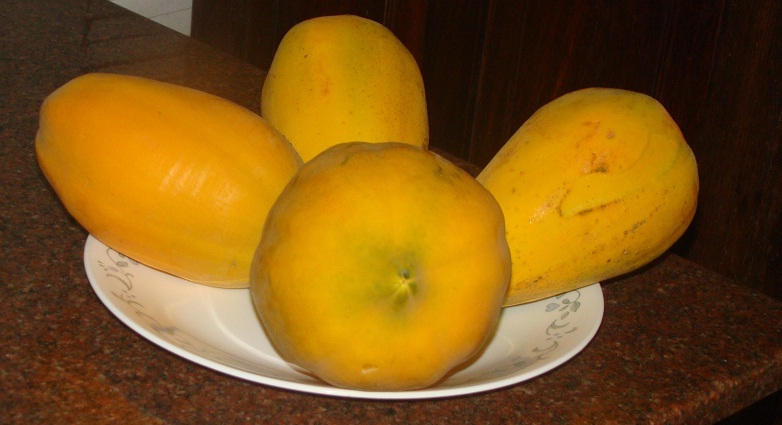 In summer, it start to produce indian mangoes, a lot of indian mangoes! We will start harvesting them if they are already ripe. After the harvest my mom will start give mangoes our friends, relatives and neighbors. We will sell the remaining mangoes on the market fow low price. Mangoes on the garden are the safest because there is no chemical used for them to grow. So it is safe and delicious to eat. You are right about mangoes that grow in one's garden are not ripened artificially as one sees in markets. Not just mangoes many fruits are ripened that way. Not only do they not taste good but since they are treated with chemicals they are injurious to health. We have avocado, pomelo, lime, lychee and banana and also mango. When there season came and time for harvest we take some for our home and the rest is give away to our neighbor. We dont sell any of it because my grandmother beleive that when you exchange fruits to cash in the next season God will not bless you same amount of fruits LOL. Your grandmother I am afraid is wrong when she says that . Many depend on their fruits for their living as that is sometimes their only mode of earning. You must correct your grandmother about this. If we had a market we would have happily sold our fruits. We do sell but for some there is no demand. Hi, Iamaw I guess you have a big yard if you have such a rich harvest. Unfortunately for me, I have a small yard where I have planted a few tomatoes, cucumbers, eggplant, garlic and onion. I don't have a rich harvest but I am proud to say that we eat our own vegetables that are natural and does not contain any chemicals. Somehow I am never successful with vegetables like the way you grow. I have tried it many times. There will always be either the birds, the caterpillars or the mongoose feasting on my efforts (lol) I did see a picture of a vegetable garden where they have put nets to protect it but that to my mind is expensive. Wow! you are very lucky to have many fruits in your backyard. I only have coconut tree, avocado tree, indian mango, and jackfruit. Usually when my avocado bear fruits, I sell it for low price. Every after 6 months the vendor but my coconut fruit and they sell it to the market while my jackfruit, I gave it to my neighbor. We fruit growers are always at the receiving end when it comes to getting a decent rate for our produce. It is the shopkeepers and middlemen get the best deal. I am going through the same thing that you are. The joy however is to see those fruits up on that tree and the opportunity we get to eat fresh fruit. Fruits are very essential commodity in my state. If you happen to have a fruit garden here be rest assured you would be making a substantial amount of money should you decide to sell your products. From the fruits harvest or picked in our garden, after selecting the ones for consumption and those to be given to friends, the rest is market commodity. It fetches my family a reasonable amount of money. If there is a demand I know fruits could be a great earner but here in this semi rural town that is not the case. Jackfruits in other States are so expensive and here not many are fond of them. It is ok actually as besides our own consumption they attract birds and those chirps more than make up for the money that we may not earn. My mother-in-law used to have a bunch of wild strawberries growing in her backyard. They were so plentiful we'd still have boxes left after passing them around the neighborhood. So she made jars and jars of strawberry jam and froze whatever was left. When I was younger, there were blackberries growing in the communal garden of our neighborhood and my mother would freeze them or we'd eat them with yogurt, oatmeal, salads, etc. But, sadly, when the management started spraying the neighborhood plants with pesticide, our blackberry days were over. Why were the plants sprayed with pesticides? That is only done if there are pests and to save trees. But in your case you say they killed your blackberry tree. Wonder what they actually sprayed. These days one is not encouraged to use pesticides as fruits and vegetables from sprayed plants and trees are not good for health. I grow both fruits and vegetables in my garden. I have mostly seasonal fruits in my garden like mangoes, mandarin orange, lychee, breadfruit, starfruit and longan. We usually sell the mandarin oranges. As for the other fruits we mostly distribute them among our neighbors, friends and relatives. We do keep some for us too. We prepare pickles with some of the fruits. That is a big list I see. If there is a market for our produce that would have been really nice. We do sell coconut, pepper, areca, jackfruit and mangoes but our bell fruit, cherries and a few others we have to just give away after keeping some for ourselves. We too preserve juices of some fruits. .
We have a large backyard so we several varieties that produce at different times in the season like avocado, mango, santol, guava, and Spanish plum (locally known as sineguelas in the Philippines). You can simply walk past and pick the fruit at your leisure. The advantage being in a tropical country is that you can plant different kinds of fruits. They grow like crazy, and all year round. I know exactly that feeling. We have these surprises with our mangoes. Being green in colour we hardly see them until some bird drops a fruit. When we engage someone to harvest the fruit we get baskets and baskets of them all hidden among the green leaves. Wow. That is one amazing land and the people sharing the land's blessings. We, however, only have two trees that bear fruits all year round. One of them is a Kalimbi tree that bears sour fruits all year round. It is not so popular because of its sourness but it is delectable to make it into a jam. The other tree is a guava tree. Which our neighbors enjoy picking from especially during summer. It is such a delight to have trees in your yard because every morning we are greeted by the birds chirping on its branches and it is such a nice thing to experience especially when you're living in a city. No doubt it is great to have many yielding fruit trees but when they have bumper crops and no takers then that is a bit worrying. That is amazing! You probably have a green thumb. It is so wonderful to see and grow fruits in the comfort of your own backyard. Also I am happy thag you give to share extra harvest from your fruits to your neighbors. That is a kind act. God bless. We gave up our city life just to be with nature. You have to lose something to gain something. This is what I always wanted to do. Today my days are spent just taking care of our property which is interesting and fulfilling. Wow! That is great. I wish I could go and visit your garden and then harvest fruits as much as I can. I have more in my virtual world like you admiring my garden. In my real life they hardly appreciate what they see. May be they are used to seeing it each time they visit us. But I get immense joy and I suppose that is all that matters. Amazing! That's one of my dreams too. I also want grow my own fruits and vegetables and maintain them on my own and do the harvesting for our personal consumption but unfortunately I can't find time to do this. So far, we only have few kinds of fruit bearing trees in our yard which the children in our neighborhood are very fond to climb to. Sometimes, we'll see them sitting on the branches while enjoying eating the fruits the picked. One really needs time to attend to gardening and that one can do after retirement. That is how I find time. I am a senior and have great interest in nature. There is joy in seeing anything that is planted when it shows results. It is the first shoot, the first flower, the first fruit and finally to see the ripe fruit is a satisfying experience. We dont have fruit in our garden, but on my grandfather's house, there are green mangoes, banana and papaya. My uncle makes juice on green mango, and it taste really good. He will grate the green mango and put in a glass of water then will add sugar and it is ready to drink, perfect with ice. While papaya and banana are eaten as is or sometimes, we put milk to add taste. They also give some to our neighbors when we get too much mangoes, papaya, or banana. I know about that green mango juice. We call it mango phool. We boil the mangoes and put them in a liquidiser adding milk and sugar. It is then cooled in the fridge. It is a delicious and healthy drink. We grow avocados, strawberries and oranges in our home. Avocado is a very versatile fruit . We make guacamole, use them as an ingredient for different salads and make avocado oil. A neighbor suggested we could sell them to a manufacturing company. Heard of avocado soap? With the strawberries we make milkshake and share them with a children's home. The kids are super excited to get them. We grow really sweet oranges which we make into juice. We were told our oranges are really good quality, we should think of growing them for export.Next year we will also be making marmalade for sale. I have an avocado tree which is many years old Somehow it has not started yielding although it looks very healthy. It is a common tree and I have seen them in other gardens. We do not have strawberries or oranges. Oranges grow in the northern parts of our country. We have been growing grafted avocados on our farm. This in agri-business activity, although we do consume them, and take some in the church as the offering. But, for the last two years, elephants have been destroying the fruits. Our farm is not far from the forest. Well its nice to have a fruit garden in your own yard because its not just you have a garden but also you have your own source to make a fruit salad????????????. Well in our yard we have different kind of fruits like coconut ang jack fruit.Its good to have it because if sometimes youll get hungry you can just pick one of the fruits and you can eat it.. I make use of our fruits in several ways. We preserve fruit juices. We have also made wine from some and we make snacks specially from the jack fruit. The raw jackfruit is also cooked. We also preserve mango pulp. The joy of plucking and helping oneself is a nice feeling too. We have fruits in our garden but not that kind of fruits that can be blended into a juice drink. We have avocado, rambutan, banana and etc. We only eat them when they get ripen. They are so yummy and one of my favorite is the avocado mixed with sugar and milk and it taste so awesome. I love fruits because they serves as alternative and temporary food when i feel hungry and they are so satisfying. 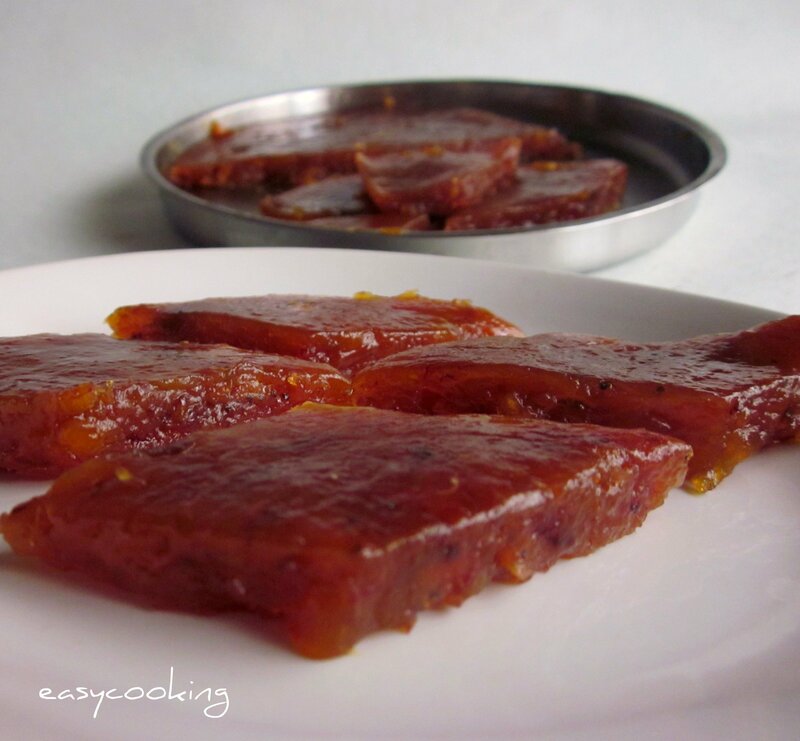 Have you tried making banana halwa. It is easy. Just pulp up the banana and add one cup of sugar to one cup of banana in that raio. Add some ghee and stir it up on the gas until it starts becoming a lump. Pour it in a tray to which some ghee is applied. Cool it and cut in into pieces. What I would do is I will check the fruit if it's still edible or not because some fruits have a worms inside that can destroy it. When I'm done checking it, I will pick it up and put in the freezer and let it cold for about a day or an hour to make it more refreshing then serve it whenever we have breakfast or dinner. And sometimes we do love having fruits as our snacks rather than having some junk foods, because we have this saying that more healthy eating, more healthy living. Obviously you do not have loads of them unlike me I am at a loss not knowing what to do with them sometimes as there is no market for some of them. I don't have fruits in my garden at home but my father owns a small country house and he does get quite a few fruits there. Usually, he makes juice with them or gives it to the neighbors. It's always fun to get fresh fruit! My grandmother, when she was younger, used to plant a lot of crops in our garden and would spend the whole day just tending to her plants. We would sell the fruits we harvest in the local market and keep some of the vegetables for cooking meals. We only got few fruits in our yard namely bananas, mangoes, jackfruit, cacao, papaya, custard apple ad sugar apple. When these trees bear fruits,we never sell them, we save up some for our own for my kids love to eat fruits and distribute the remaining to our neighbors. Specially with the mango seasons around, me and my sisters would gather up in my parent's porch and eat lots of green mangoes dipped in chili shrimp paste. I think having that volume of fruits in your backyard can help you start a small fruits business, you have plenty kinds of fruits and its nice because you don't have to buy fruits in the market. In our province all we have is papaya, coconut, mango and jackfruit. We only consume it when they are ripe or ready to be eaten, but what you have in your garden can be considered as a small farm you can sell it in town to earn some money. We actually have lemon and dragon fruit in our backyard. whenever it is on season we usually harvests everything and we will make lemon juice and some fruit salad. The advantage of having your own plants in your backyard is that you don't need it in the market and you also eat it fresh. Aside from that it can also help us save or earn money. My parents and I have been growing various fruits on our farm. Although these are for family use, we do take them to the market whenever they are in plenty. I think that you are very lucky to have such a huge garden where you can plant different kinds of fruits and also sell them after sharing them with your neighbors and consuming them in your house. I have a very small garden in my terrace where I have planted flowers, some vegetables, and herbs. I don't have any kind of fruit planted in my garden. The tomatoes, chilies and Okra that I grow in my garden are only sufficient for our own use. Someday in the future, I would definitely like to have a big garden like yours. Growing potatoes in old tyres! What fruits are you craving? Do you have artefacts in your garden? Growing Vegetables in Pots - be self sufficient! Have you grown your own vegetable garden?